HomeRubber Bracelet WristbandsAdult Size 8" Awareness WristbandsSupport Lupus Awareness purple wristband - Adult 8"
Great price for a great cause. Quick delivery. Disease and are fighting it.I Thank the Support Store for having many items to bring awareness to a lot of causes keep up the Great Work. Best UsesTo wear and show support. I really love this item, but the only thing it took almost a week to get them when other online websites only take 2 days maximum. This could be something that can be easily fixed. Thank you. Didn't create the awareness I would have liked. Too small and barely readable. Just looks like a plain band unless someone is sitting next to me. 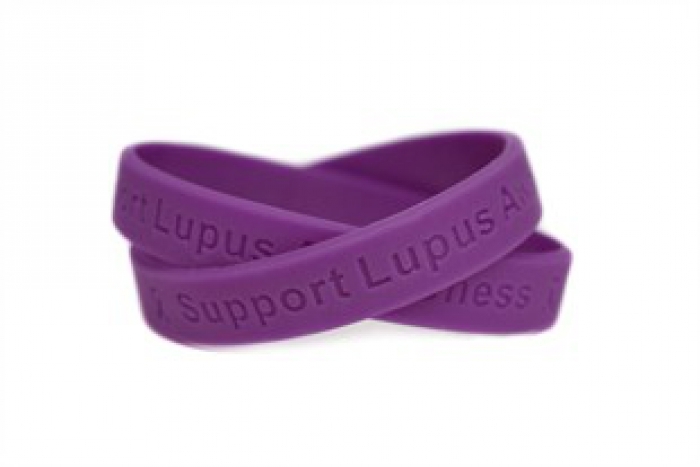 Merchant Response:Thanks for choosing our debossed Lupus awareness wristband. Think of the color as the primary way you are communicating about your cause. Then when someone asks why you are wearing it you can show them it carries a message indented right in the rubber for Lupus. Debossed bands are the most durable and the message never wears off. But we%u2019ll make a note that you would like a color-filled option as well. Product arrived quicker than I expected! Love these bracelets. I bought them for my support group friends. I love that I can wear this to support the illness that I, personally, have. The only thing I was not happy with is that you can't read the message because it is the same color as the wristband. It would have so easy to read if it had been in white on the purple band.